Bentsen was selected in large part to secure the state of Texas and its electoral vote for the Democrats even with fellow Texan George H. Before completing his military service he was promoted to the rank of Colonel in the Air Force Reserve. He was successful and became very secure financially. He also served in the House of Representatives from 1949 to 1955. 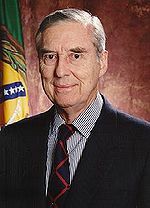 (February 11 1921 – May 23 2006) was a four-term United States senator (1971–1993) from Texas and the Democratic Party nominee for Vice President in 1988 on the Michael Dukakis ticket. Lloyd Millard Bentsen Jr.